The alleged leaked video of controversial TV host Mo Twister (real name Mohan Gumatay) about sensitive issues with his ex-girlfriend gathers more flak than sympathy. 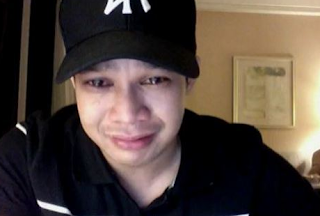 In the said video that was allegedly taped in a room of a posh hotel in Singapore on July 28, 2010, Gumatay is making a tearful confession about an abortion that actress Rhian Ramos, then his girlfriend, is going to have in an undisclosed location in the city state. Titled “RepairedMovie.com”, it was uploaded by a certain PrettyJenny55 on November 28, and has about 81,000 hits as of Saturday morning, December 3. In a country obsessed with show-biz controversies like the recent Piolo Pascual-KC Concepcion breakup more than the fate of “Abadilla 5” or “Morong 43”, the said video has gone viral, picked up by various blogs and websites not even concerned with show biz. Ramos has kept silent over the issue but GMA 7 has announced its plan to file appropriate charges on Gumatay. Ramos is a prized talent of GMA 7, which was once Gumatay’s home network before he transferred abruptly to the newly-revitalized TV 5 also middle of last year. GMA 7 charged Gumatay and TV 5 for breach of contract. Since her entry to show-biz a couple of years ago, Ramos has been groomed as the next big star after the reigning GMA 7 talent Marian Rivera. Viewed by show-biz insiders as an unlikely couple, for a time Ramos and Gumatay didn’t reveal their relationship in public until they broke up in May this year. A host-DJ since the 1990s, Gumatay has a love child with former actress Bunny Paras, who has been based in the US and has since got married to an American. In early 2000, he vanished from show biz to elope with then up-and-coming Filipino-Australian actress Janet McBride. Gumatay was able to recover his career when he started hosting a controversial FM radio program that has a segment on entertainment celebrities making confessions about their sexual conquests.